Read the ruminations of our own Dr. Lloyd Berg, PHD and Pineapple Guru. From humble beginnings we've grown to become the third largest pineapple importer into North America. Our fruit is also available in the U.K., Spain, Italy, France, Germany, Belgium, The Netherlands, Turkey, Russia and Korea. And our customer list continues to grow. was formed in Costa Rica by three partners in 1997 with the agreement that all funds generated would be reinvested into the farms. 100,000 pineapple seeds were purchased and the seedbed was planted. The first container was exported on July 4th, 2000 and total sales in the first year were 250,000 cases. Our first agreement was signed on a napkin in 2001. A second, "more formal" contract was signed in 2006. This time it was written out on lined notebook paper. Today the original 140 hectare farm has grown to more than 3,000 gross hectares with more than 1400 net hectares of pineapples and 275 hectares of conservation area and forest reserve to protect the indigenous wildlife, which includes three toed sloths, Toucans, Macaws and other parrots, deer, wild turkeys, and three types of monkeys. We've even spotted two Jaguars on the land. Those 100,000 seeds have been multiplied many times over and now provide the capacity to plant 650,000 pineapple plants (10 hectares) per week. 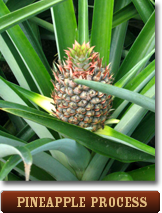 Annual production has grown from 250,000 12 Kg cartons of pineapple in the year 2000 to an estimate of 11 million in 2015. Not bad for a bunch of farmers.